The M325 Command Car is a light patrol vehicle previously in service with the Israel Defence Forces (IDF) and built by Israeli Automotive Industries . The name “Nun-Nun” is an acronym for the Israeli word for “Weapons Carrier” and entered service with the IDF in 1970. Although no longer in service with the IDF, it serves today in countries such as Chile, Peru, Kenya, and Lebanon. The Nun-Nun was produced in two basic versions: the patrol vehicle and the cargo/weapons carrier. The patrol version has multiple weapons mounts and allows for easy crew access/egress. The crew sits in the middle of the rear compartment and looks outward. There are usually machine guns mounted on each side, the rear and in the front. On the other hand, the cargo version actually comes in two versions: the "A" body type with fold away bench seats in the rear, facing inwards and the "B" body type with seats in the rear- center facing outwards. These vehicles are powered (probably, we should underpowered) by a six (6) cylinder engine. 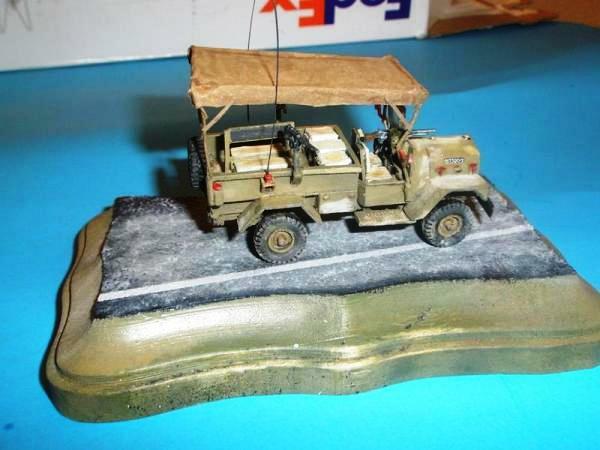 There is only one company that offers a Nun-Nun model in 1/72 scale, Model Miniature of France; which specializes in 1/72 models of equipment/vehicles of the Mid East conflicts. They offer 3 versions of the Nun Nun, which all come with an applicable figure. The versions are: The IDF Patrol Variant, Cargo Variant and a Lebanese Forces version with a ZPU-1 14.5mm anti-aircraft gun in back. The cost of the kits range from about $35 to $40 USD. The kits are cast in a brittle grey resin with the overall detail level being good. 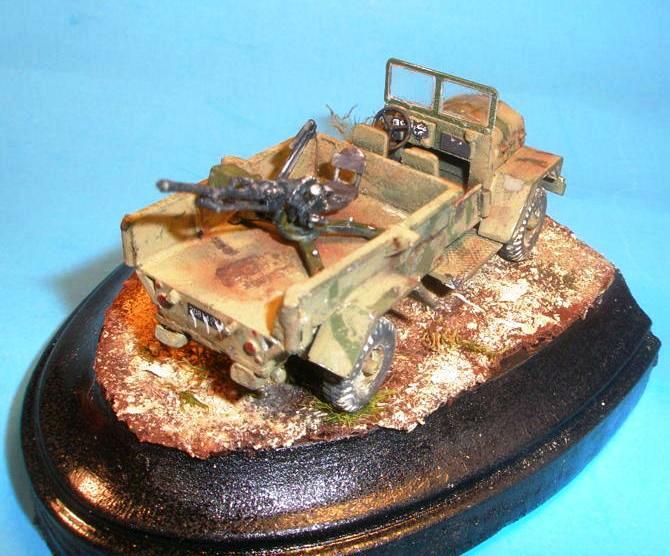 However, the vehicle undercarriage is less well done due to presence of excess resin. The good news is that the kit tires were excellent and the figures top notch. I did break off the hand of my IDF figure but will use him in the future. I will also use the Lebanese figure, which could also present a U.N. trooper, in the future as well. Since I had two of Model Miniature's Nun Nun kits in my possession, and since they are so similar, I decided to build and review both at the same time. The two kits I covered in this review are the IDF Patrol variant (MM-R001) and Lebanese version with ZPU-1 AA Gun (MM-R040). Also, in this review, I will mostly concentrate on the more difficult or unusual portions of the model kit build. So basically, if things go right with a portion of the build, I won't be mentioning it. The first kit I started building was the IDF version. The instructions consist of two (2) sheets of paper. On the front side of page 1, there is technical info about the vehicle, some history and painting tips. On the back side of page 1, there is an exploded view of the parts and several wallet size photos of the Nun Nun. Page 2 contains photos of the actual assembly sequence on both sides. The inclusion of assembly photos is a nice touch, but they are fairly small and not very clear or defined (fuzzy and dark too). As a result, the instructions made figuring out exact parts placement. Please note: The instructions would have you add small parts such as the machine gun and side mirrors at the very start. However, I recommend against that suggestion as they could break off as you work on the rest of the model. Anyway, on to the construction; Be careful removing the parts from the mold plug, as well as when sanding them as they are delicate due to the brittle nature of the resin. 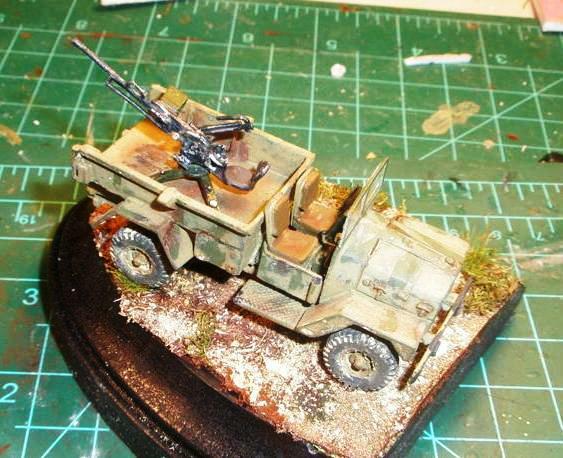 Also, make sure to dry-fit all parts as there tends to be resin build- up on many of the surface areas. In addition, there are also a lot of mold seams to clean up as well. None of this parts preparation is difficult, it's just time consuming. 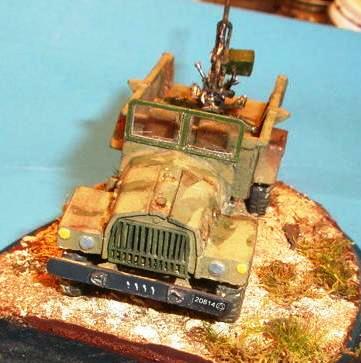 In noticed that the two kits were a bit different, the newer version (Lebanese SPG AA variant) of the kit has panel lines for the hood as well as a filler cap for the radiator. To replicate these features on the "older" kit (Patrol Variant) I used a UMM-USA scribing tool to produce the panel lines and a bit of sprue for the cap. Another thing you should know is that when you complete the driver's section and you insert the tub into the main body, it won't fit without shaving off resin from both pieces. The same holds true for the axles as each contains a transmission bulge; the front axle needing more resin removal and sanding than the rear. In addition, there is a windshield frame for one side only as it is the standard on the patrol version. However it is way too thick and must be sanded down. I then added a piece of clear plastic, cut to size. 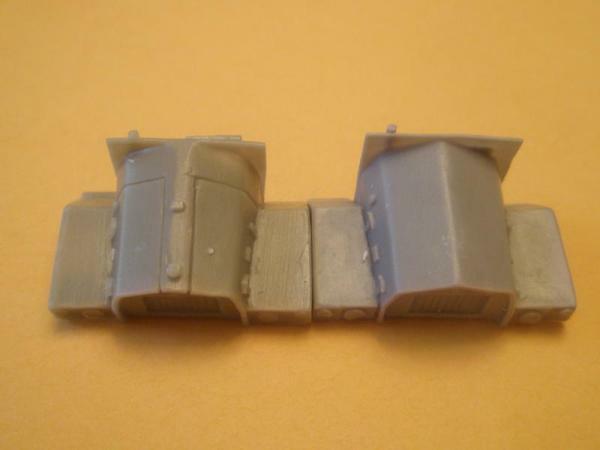 In addition, in retrospect I should have also sanded down the fenders to be more “in-scale” as well. Lastly, as it relates to the kit construction, the instructions do not show the location of the antenna mounts. They should be placed behind the rear machine guns. Unfortunately, the kit does not come with decals but they are pretty basic as they are standard IDF vehicle markings. I got mine from the spares box. 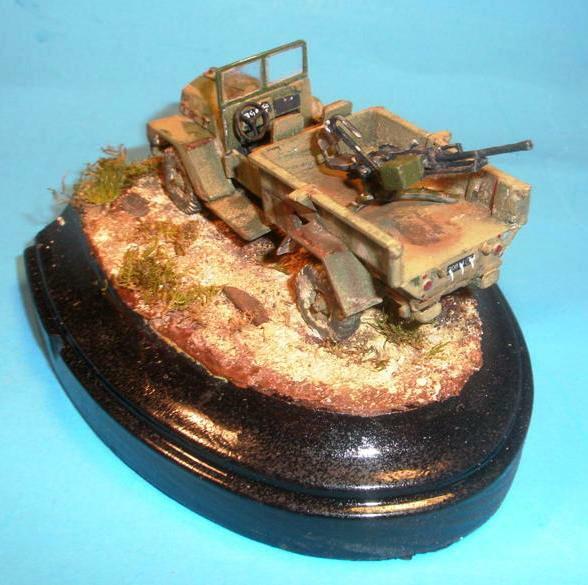 To paint the model, I used Model Master Israeli Armor Sand with the usual pastel and oil weathering. 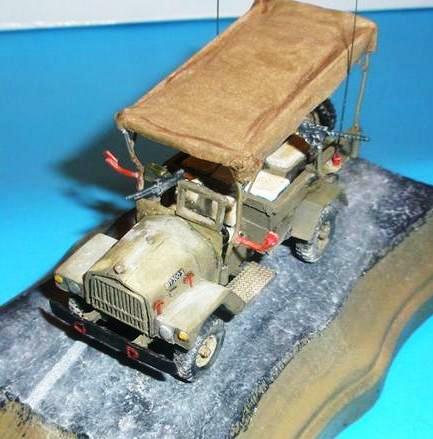 Also, most of the IDF Patrol vehicles had a tarp on top, so it would have been nice to have the frame included in the kit. However the frame comes with the cargo version of the model kit. In this case, I made my own frame using wire and tissue paper with white glue in a 50/50 mix. 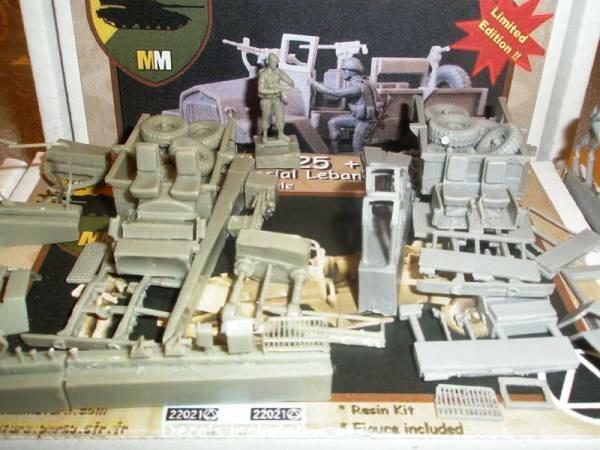 Now, on to the construction of the Lebanese M-325 with ZPU-1 AA Gun kit. For the most part I followed the same build process and encountered the same issues as I did with the Patrol Vehicle. But obviously there are some differences. For instance, the big differences between these two kits (other than the AA gun in the back), is the addition of decals, the scribed hood and the inclusion of a radiator cap. In addition, this kit only came with a one-page instruction sheet. If I did not have the Patrol vehicle instructions this build would have been a lot more difficult. Another difference between both kits is this model kit version does contain a front roll bar, unfortunately mine coming broken. Since the roll bar was not always used on all Nun Nuns anyway, I left it off. In addition, and surprisingly, a few more air bubble holes were present (and needed filling) on this kit when compared to the IDF Patrol version. 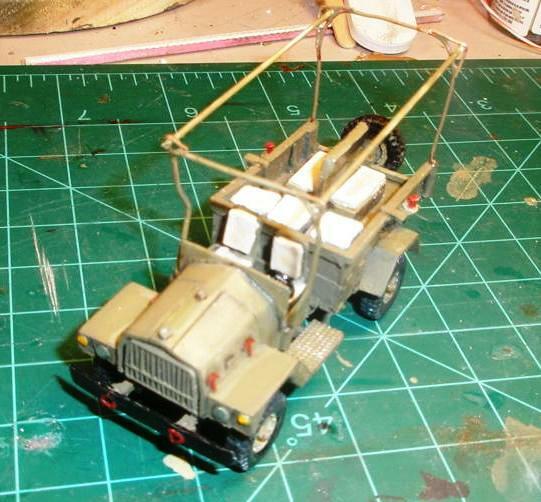 Finally, the ZPU-1 AA gun was difficult to build as only one fuzzy picture of the finished product was included in the instructions. So, you'll definitely need other references to get it right. Thankfully though, there are plenty on the Internet. 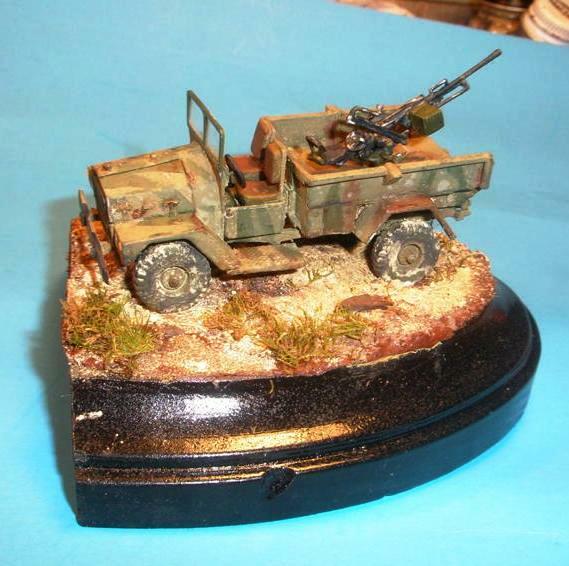 I painted and finished the model as a truck taken from the Lebanese army and used by Hezbollah; with basic rough camouflage and lots of weathering. Those trucks tend to be dirty. The decals added included two markings: the Lebanese I.D.# and a symbol. But, be careful, they are small and easily lost. Although I had a great time building the model kits, you'll definitely need references and there's a lot of clean up to it. However, the final product comes out very nice with some work. In fact, despite these issues, I would build another one of these kits as it covers such an interesting subject. I give a lot of credit to Model Miniature for producing such a unique kit line. In fact, I'd love to see an ambulance version or police/riot version mounting some protective screens. Thanks to my own pocketbook for the review sample.